For many, fairies represent freedom, beauty, and eternal youth. 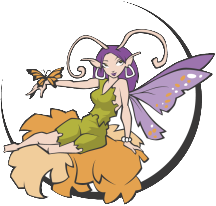 Most see fairies as innocent and childlike. However, as representative of forces of nature, they can be dark or light, fickle as the changing wind. Wondering why we list some fairy candles with the angels, and vice versa? There is a Christian belief that fairies were created when God cast out the rebellious angels from Heaven. Those that landed on earth became fairies. Looking at our examples, you can see where that may be true! This cute baby is small enough to fit inside a lotus flower! This cute baby is small enough to fit inside a rose blossom! These two impish fairies look at the world back-to-back.